why the phone hasn't white color ? back to nokia or iphone ? Well, after nokia's release of Lumia Windows phone, might I get more interested in Windows phone. However I still wanted this phone to land in India officially from Nokia. N9 is still only front button-less phone. Is it necessary for nokia to have those windows buttons on Lumia. Window Phone people should throw Windows icon ( 4 tilted sqaures) which looks very sick as people are seeing it every day when there system boots. Windows phone should create a separate brand logo and icons and use it on phone. Button-less phone is good idea. As well nokia should support N9 along with Windows. There is no need to throw away Meego just becoz you have got Windows Phone OS. Nokia can always keep its variety of products ( for which nokia is known for..) going to some extend and see how windows phone is received in market. If windows phone is same magic as old nokia products, they can discontinue Meego. Apart from it, nokia should be quick to launch all the products in every market same time. Nokia gears ( like 360 speaker system) is also not available in India ( Atleast i cant find any online vendor selling it). Nokia can loose if they are too late. India is still market where blackberry and apple has not able to move a single stone. Forget sweeping market like Nokia did once. AnonD-12237, 28 Oct 2011i downloaded thr opera browser for meego from the official website, but its not for meego harm... moreFirefox 7 has one for Maemo. this is a great phone.. THIS IS MY DREAM PHONE. i live here in the Philiippines. my brother is working in Saudi Arabia and N9 is cheaper there. can any body tells me if it supports video calllll???????? hmmm, 26 Oct 2011The battery life... I get two days per charge Flash player... try the opera version labs.... morecan you please tell me how to get opera?? and how to get firefox. Looks like Diamond? I just googled HTC Diamond, and it's totally different design. i can't understand why people keep on comparing phones. phones are just like human because they are made by human. we are IMPERFECT! because nobody is perfect. right? 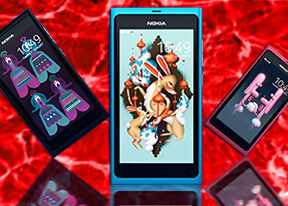 N9 (BLACK/MAGENTA) would be my dream phone always and forever. so please just STOP comparing. if you dont like it. FINE. if you like it! FINE.